From the upscale Asian lodging brand of the Genting Group, Maxims Hotel is the all-suite luxury hotel in the Philippines, setting the benchmark for high-end accommodations in the country. One of the finest hotels in Manila, The Garden Plaza Hotel and Suites' rooms are thoughtfully designed, offering valued guests a sanctuary from the city's hustle and bustle. Recently awarded by the Baguio Centennial Commission as one of the 10 oldest institutions in Baguio, Casa Vallejo has been brought back to life as a boutique hotel in the heart of Baguio City, Manila’s summer capital. 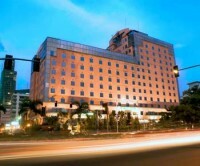 Bayview Park Hotel is a mid-range or average type of hotel you’ll find at the corner of UN Avenue and Roxas Boulevard. The rates here are quite inexpensive though not exactly the budget for anyone who’s backpacking. Hyatt Hotel and Casino Manila is a great option if you’re looking for five star luxury hotels and resorts in the country. 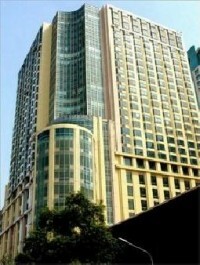 It is situated in Malate with a stunning view of the famous sunset at the bay. It is also a place to go to if you want to enjoy world-class casino facilities. Hotel H2O is a unique hotel concept that is located inside the Manila Ocean Park. They offer a unobstructed view of the bay, a breathtaking seascape dotted with lights at night, and aquarium themed rooms enveloped in a classy, stylish package. With a prime location in Pasig City, Astoria Plaza is a great place to stay because it's near Ortigas, Makati, and Greenhills. This hotel is complete with facilities such as restaurants, a lap pool, massage center, and a complimentary round trip shuttle service around the Ortigas Business District. 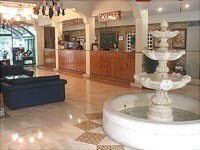 La Roca Hotel is an homey establishment located along Graham Avenue in the beautiful City of Tagbilaran in Bohol. The hotel has a nice facilities such as a swimming pool where guests and tourists can relax and enjoy. Located in the central business district of Tagbilaran City, the MetroCentre is a place for business or for pleasure. Equipped with cozy and elegantly furnished guest rooms, it provides an oasis of comfort and relaxation, infused with a touch of Boholano charm and warm elegance. 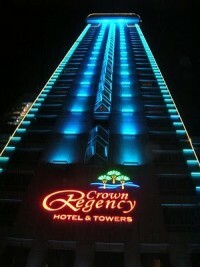 The Crown Regency Hotel and Towers is a hotel complex in Cebu City, Philippines. The main building, the 38-storey Fuente Tower 1, is one of the tallest hotel buildings in the country at 140 meters (459 ft). It is likewise the tallest building in Cebu City and the country's tallest building outside of Metro Manila.